"This movie seems like it was made for me...Thank you." "Very inspirational. If you enjoyed The Secret you'll enjoy this as well"
"Wish this was on the theater loved it!!" " The best film I've seen in years." "I needed this today. Thank you." "Profound, beautiful and awe inspiring." "This touched my heart deeply. I feel changed in some way." "Powerful real life stories... I needed tissues." "I never tire of watching this movie it inspires and lifts me every time i watch it." "Absolutely loved it... such a powerful tool for change!" "So many tears! loved it"
"My heart is currently breaking wide open - perfect timing I found this"
"wow... powerful... and well done"
"One of the best movies I've seen. Truly a treasure!" "The best inspirational movie I've seen in my whole life." "So incredibly moving! I cried so much! Thank you for this film." "Lit up my heart....smiled....cried... beaming with gratitude and joy." " This very powerful film was filled with aha moments for me." "This is just what I needed to hear to start healing my heart." "This was so powerful and truly touched my heart..."
"Its seriously a good ending and makes the sad parts worth it"
"Incredible!! Had me in tears most of the time... Will be keeping this one handy to watch again:)"
"I wish EVERYONE could watch this movie!" "I loved it!! It really helped me let go of some pain tonight and old anger." "a wonderful film, moved me to tears and insights." "I'm going to have to own this video so I can watch it over and over. " "Amazing to say the least"
"This made​ such an incredible impact on my life, absolutely love this film!" "Best heart felt film Ive watched in my life time"
"Amazing! Loved it! I felt my heart expanding!" "A journey so exciting and scary all in one package but so so worth it." "So powerful and inspiring for me, I cried"
"I am about to watch the movie for the second time, to take notes"
"This is an amazing documentary on the heart which everyone should watch." "A beautiful bouquet of sages with wisdom we all can learn from." "...filled to the brim with excellent stories both personal and parabolic." "What a truly WONDERFUL documentary... I'm really kind of speechless actually." "If you have a dream you've been wondering if you should make come true, watch this movie." "One of the best documentaries we've ever seen." "I have watched it over and over and learn something new everytime"
"You will cry and be completely awestruck by what you learn!" "very good movie... Its worth watching more than one time." "I watch this DVD at least once a week. I love it!" "An amazing film that should be required viewing for all humans." "A must see for everyone!" "My mind is definitely blown right now...."
"Life changing, powerful messages and fascinating science." "We laughed. We cried. We have now watched it three times. Enough said." "Superb directing and a supreme cast." "A masterful weaving of stories and science." "Love this movie. Have watched it now 9 times." Starring Isabelle Allende, Maya Angelou, Paulo Coelho, Deepak Chopra, Mark Nepo, Eckhart Tolle, Gary Zukav and more. 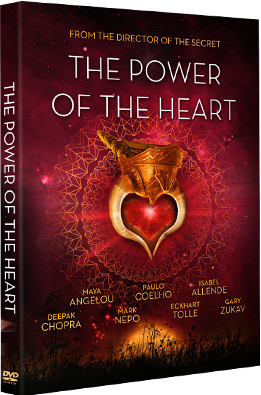 From the director of The Secret, comes a life-changing film about the astonishing power and intelligence of your heart. Featuring stunning science interwoven with powerful real-life stories from some of the most inspiring icons of our age, this timeless documentary will lead you to uncover... and rediscover... the treasure in your chest. You have 7 days to watch after clicking play. It's the perfect gift under $5. Inspire your family, friends and co-workers.